In a world where everything has a price, the most priceless things are free. 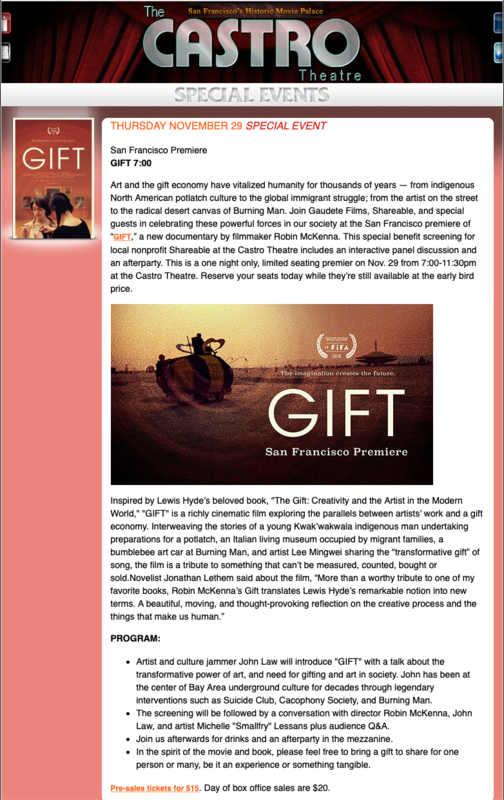 I have the honor and pleasure of introducing a new film by Robin McKenna called “The Gift” at the Castro Theater this Thursday November 29th. This movie is a visually delicious sampling of personal stories that illuminate some of the philosophy behind the popular and influential book by Lewis Hyde published in 1983. Robin showcases four examples of “gifting” as manifest in some very different cultural settings. My favorite is the story of a anarchist(y) squat in a giant abandoned commercial swine abattoir. Roma gypsys, immigrants and struggling artists conjured Metropoliz out of a derelict property on the outskirts of Rome that no one seemed to want. This experiment ran into some bumps when the real estate started rising in value. A clever counter to this inexorable tide of property greed we have all had to contend with in some fashion was for Metropliz to emphasize the (soon internationally recognized) artistic contributions that famous artists have painted on the various huge walls of the complex. The stature of this new museum has helped fend off eviction attempts by real estate concerns and their political servants to date. The Gift here is an ongoing sharing of the space with the occupants and the outside world of art and culture afficianados. Another of the four samples of “Gift economies” finds Robin and crew documenting a native potlatch Kwak’wakwala community in Alert Bay in Pacific Northwest Canada. The idea of “The Gift” in some form or other is a part of many tribal and indigenous cultures going back to pre-history. Gifts are not always accepted and often weighted significantly with social and cultural obligations; the unifying factor is simply that the The Gift must not be held. It must be shared with others who in turn are obliged to pass it along. The Gift also follows the work of artist Lee Mingwei who’s work is a “life meets art/art is life” in the Zen tradition. His work is influenced by Lewis Hyde’s The Gift, a book he carries the book around with him when he travels. Hyde has wrote an introduction to Mingwei’s work, at the Isabella Stewart Gardner Museum in Boston. Last but not least in the quartet of lovely of Gift vignettes is Michelle/Smallfry who created a “circular gift” camp, art car (giant bee called Beezus Christ Supercar) and crew of busy bee pals that took gifted honey from SF beekeeper acquaintances and passed along for free on the playa at Burning Man. I enjoyed these four symbolic and literal tales, each illuminating the concept of “The Gift” in different though related fashions. Our world, western culture, is driven in large part by the great and valuable philosophies of the spirit of the individual, freedom of will and self determination ruled by “none other.” Unfortunately, we have swung too far in that direction, abandoning the balancing power of community, sharing of resources, the idea that some things must remain free. The Gift is a timely message in this world where literally everything has a monetary value, a price – whatever “the market” demands. If we cannot return to a balance between the individual and the communal, we are surely doomed to a future of even more greed and inequality. Pepe Ozan was a slender compact man, elegant at times, forceful at others. In all ways but physical stature he was BIG. Big ideas, big appetites, big action, big heart, big visions of what to make and do: big life force. It’s not that he was a small man physically – he was average height and weight with a very fit, muscular build. The thing that constantly amazed me and so many others who knew and worked, lived, clashed, created and destroyed with him was the idea that such a modest seeming vessel could contain such volcanic energy and drive. I had the honor and great good fortune to know and work with him on several very intense projects in the mid-90’s. I first met Pepe in early 1994 through William Binzen and Judy West. We were planning the 2nd years iteration of Desert Site Works, to take place at Trego Hot Springs over the Summer Solstice. Pepe built his first Lingum at Trego that Summer and came back with us to Burning Man a few months later where he built a larger Lingum and designed the ritual performance around it, immediately taking his place as the premier creator at BM. He could be a hard task-master to those who assisted him, but each and every one was better for the experience. Deeply loved by many, feared by a few, he was respected by all. Though best known to the world as the originator of Temple and the Opera at Burning Man, his talents and ambitions transcended that event. His fascination with India led him there on several occasions culminating in unique and insightful films about that strange and kaleidoscopic land. His other world travels, undertaken before I met him included sailing across entire seas in small vessels, trekking remote sectors of the planet and living amidst and coming to know obscure cultures. He never did anything half-assed. His contribution to the CarHunt expedition that Robert Burk and I conceived and executed in collaboration with the machine art cabal PeopleHater in 1995 was to build the 100% steel wheels for the hunt vehicle. A small task for so talented a metal worker, he nonetheless attacked it with gusto and an unbending will to make the finest, strongest, most perfect plate steel, rebar treaded “tires” for an Oldsmobile Vista Cruiser Station Wagon imaginable! – a pretty silly task, on the whole for someone used to commanding hordes of costumed performers on massive sets that he conceived and brought to life, but Pepe made art fabricating those wheels. Pepe and the mischievous Robert Burk sailed across the Atlantic together having near death as well as transcendental experiences. I heard some tales from both men and marveled at their tenacity and luck. Their friendship was strained by the experience, only to reignite in later years while working together on Burning Man. There were intense, vibrant, joyous, stormy, epiphanous experiences swirling constantly around the man. 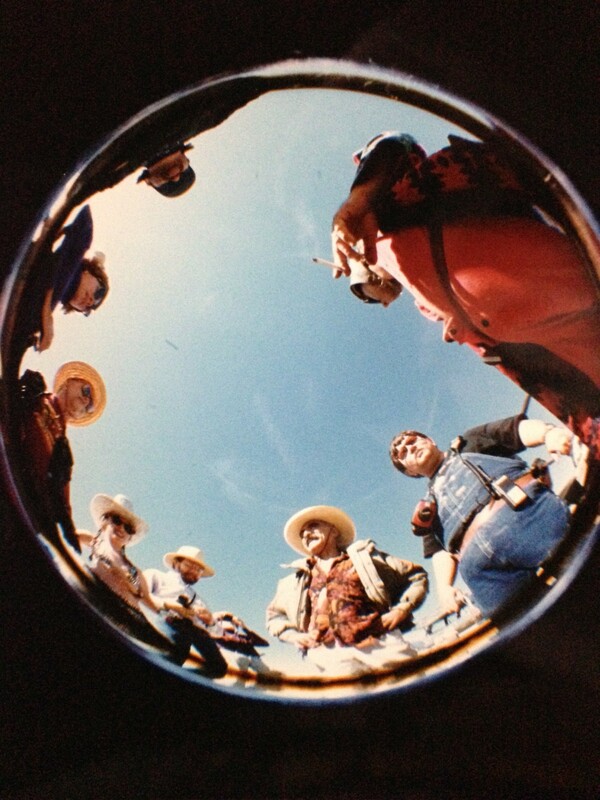 I recall him commandeering dozens of helpers in a constant stream of mud from Trego to the giant tower he was building on the playa one year. He worked his crew hard, hoping to get all the mud needed before being shut down at the source by the BLM. His rage at the stupidity of being banned from taking mud from what was effectively a backhoe trench through a giant man made scar along side a railroad track for “environmental” reasons would have been comical if it hadn’t been so scary. His love for and closeness to beautiful women was the envy and toast of we lesser men. It seems silly in a way, that one of my most cherished memories of Pepe was merely hearing his voice on my answering machine one day when I was really depressed. “HALLOOO JOAANN!! THIS IS PAEPE!!! !” Just hearing that coruscating, deeply alive voice on a machine was enough to completely change my mood, sending me out into the world on an important day, a day I needed to be on my game. That’s what Pepe did for me, every time I saw him, which sadly in later years was not often. He reminded me how vital and vibrant life was if you chose to live it.